Rouse, Rebecca 2018. Interactive Storytelling. Vol. 11318, Issue. , p. 369. Yeritsian, Gary 2018. Participation from above and below: Brand community and the contestation of cultural participation. Journal of Consumer Culture, p. 146954051878757. Coleman, Robin R. Means 2018. A Companion to the History of American Broadcasting. p. 389. Biggin, Rose 2017. Immersive Theatre and Audience Experience. p. 1. Kalogeropoulos, Antonis Negredo, Samuel Picone, Ike and Nielsen, Rasmus Kleis 2017. Who Shares and Comments on News? : A Cross-National Comparative Analysis of Online and Social Media Participation. Social Media + Society, Vol. 3, Issue. 4, p. 205630511773575. Saffle, Michael 2017. Adaptation, Awards Culture, and the Value of Prestige. p. 151. Brisini, Travis 2017. The practice of smiling: facial expression and repertory performance in Professor Palmai’s “school for smiles”. Text and Performance Quarterly, Vol. 37, Issue. 1, p. 1. Hickey-Moody, Anna 2016. Being different in public. Continuum, Vol. 30, Issue. 5, p. 531. Hickey-Moody, Anna 2016. Youth agency and adult influence: A critical revision of little publics. Review of Education, Pedagogy, and Cultural Studies, Vol. 38, Issue. 1, p. 58. Stanyer, James and Mihelj, Sabina 2016. Taking Time Seriously? Theorizing and Researching Change in Communication and Media Studies. Journal of Communication, Vol. 66, Issue. 2, p. 266. Ho, Helen K. 2016. Defining Identity and the Changing Scope of Culture in the Digital Age. p. 1. Smets, Kevin Van Bauwel, Sofie Meers, Philippe and Vande Winkel, Roel 2016. Film-viewing in Turkish and Moroccan diasporic families: a gender and place perspective. Gender, Place & Culture, Vol. 23, Issue. 4, p. 556. Vandevelde, Iris Meers, Philippe Van Bauwel, Sofie and Winkel, Roel Vande 2015. Sharing the Silver Screen: The Social Experience of Cinemagoing in the Indian Diaspora. BioScope: South Asian Screen Studies, Vol. 6, Issue. 1, p. 88. 2015. Real Men Don't Sing. p. 375. Méadel, Cécile 2015. Moving to the peoplemetered audience: A sociotechnical approach. European Journal of Communication, Vol. 30, Issue. 1, p. 36. Mihelj, Sabina 2015. Audience history as a history of ideas: Towards a transnational history. European Journal of Communication, Vol. 30, Issue. 1, p. 22. Bourdon, Jérôme 2015. Detextualizing: How to write a history of audiences. European Journal of Communication, Vol. 30, Issue. 1, p. 7. Mihelj, Sabina and Bourdon, Jérôme 2015. Doing audience history: Questions, sources, methods. European Journal of Communication, Vol. 30, Issue. 1, p. 3. Doss, Erika 2015. Hopper’s Cool: Modernism and Emotional Restraint. American Art, Vol. 29, Issue. 3, p. 2. Frost, Jennifer 2014. A Companion to Warren G. Harding, Calvin Coolidge, and Herbert Hoover. p. 338. 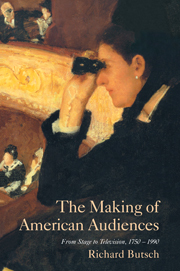 In The Making of American Audiences, Richard Butsch provides a comprehensive survey of American entertainment audiences from the colonial period to the modern day. Providing coverage of theatre, opera, vaudeville, minstrelsy, movies, radio and television, he examines the evolution of audience practices as each genre supplanted another as the primary popular entertainment. Based on original historical research, this volume exposes how audiences made themselves through their practices - how they asserted control over their own entertainments and their own behaviour. Importantly, Butsch articulates two long-term processes: pacification and privatization. Whereas during the nineteenth century, overactive audiences represented a threat to civic order through their unruly behaviour, in the twentieth century, audiences have become more passive, dependent upon and controlled by media messages. This timely study serves as an important contribution to communication research, as well as American cultural history and cultural studies. Introduction: Participative Public, Passive Private? 18 - Home Video: Viewer Autonomy?